When returning home late one day after school, Naoko decided to take a short cut through the forest behind the school. However, while going through the forest. Naoko saw a strange glowing light which she followed. Upon reaching a clearing, the light changed however, and a huge one eyed monster suddenly appeared. Telling the other people in her club about her experience, Naoko, Chiharu, and Rika all decide to go back to the forest to check out the ghostly appearance dragging Sakura in tow. Poor Sakura however, is terrified of ghosts and begs best friend Tomoyo to go with her. On the other edge of the forest, the 5 girls once again find the strange light and once again a strange monster appears. Only this time, everyone sees different things. Sakura sees a woman with long hair while Tomoyo on the otherhand sees a huge steamed bun! What is causing the strange sightings? 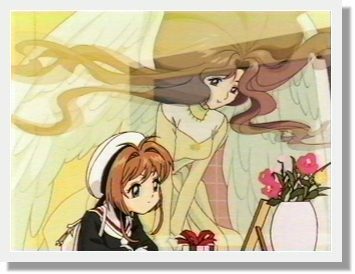 Deciding to go back and investigate, Sakura and Tomoyo accompanied with Kero go back to the cliff edge clearing, only this time, when the woman appears to Sakura, she sees that it is in fact her mother. What's Sakura's mother doing in the forest behind Sakura's school? Could it be that she misses Sakura and wants Sakura to join her? This episode still maintains the sweet level of the series as a whole, however, I find that this is perhaps one of the best episodes storywise. Talking about death let alone the death of a parent is never easy yet this episode is able to touch on the subject in a gentle manner. While most children Sakura's age will not have any understanding of what it is like to lose a parent to death, there are undoubtedly many families out there which are single parent families. Perhaps not entirely the same, but at the same time, many of the problems faced and the manner in which household matters are taken care of may well be the same. Watching the expression on Sakura's friends' faces when Chiharu asks Sakura what would be a good gift for mother, we realise the difficulty that faces many people when it comes to such matters. How does one ask these questions tactfully, or is it best not to ask at all, and what happens if you forget or just don't realise that the person you're asking may not be able to answer for unfortunate reasons? But even more than just that part, is watching as Sakura tries to understand why her mother might be in the forest behind the school and her wish to meet her mother again. Yukito's question to Sakura after she'd fallen from the cliff is a gentle way for him to make her question the image that is seen on the cliff top and gives Sakura the determination to face what seems to be her mother. More than anything, the story here and the character relations that we see are key to this episode. The level of Touya's devotion to his sister and Yukito's relationships with both Touya and Sakura add to the depth of the characters as well as the story as a whole. Solid voice acting on the parts of the main characters combined with gentle music help to enhance the viewing experience. Overall, a solid episode in story and character development.